The Von Duprin 22 is Economical and Strong. As the least expensive Von Duprin you would think it might be cheap, but it is still one of the strongest exit or panic devices out in industry today. This makes it ideal for any public facility, or other areas of abuse. A little education goes along way, so hopefully I can educate you on the history, types, ratings, grades, construction, critical measurements, reasons to use, and differences with the Von Duprin 99, options and general comments. In 1903 the Iroquois Theater Fire in Chicago claimed the lives of almost 600 people. Carl Prinzler was supposed to attend a show at the theater that evening, but he had other business dealing going on, so he missed the show. Back in the 1900’s it was common for theater owners to lock the doors shut, so non paying people could not get into the shows. Locking the doors kept the non paying people out, but also locked the paying people in the building. Prinzler was distraught at the loss of life, so he tried to figure out a way to keep doors locked on the outside, but still open in the inside. Prinzler sought help from his friend, Henry H. DuPont who had architectural engineering abilities to help develop this new device. In 1908 they brought there new product to market with a company called Vonnegut Hardware Company. Owing to the combined effort, they came up with the name Von Duprin, which came about by a combination of there names. The Von Duprin 22 comes in two models, one is called a Rim Device, and the other is called a Surface Vertical Rod Device. A Rim Device is one that has a latch bolt that sticks out of the end of the device. It latches on the Rim of the door. 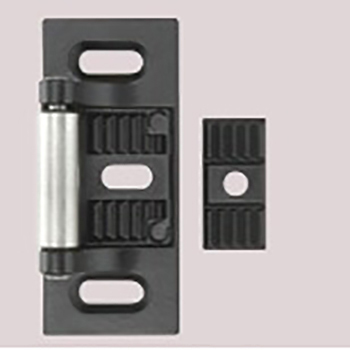 The Surface Vertical Rod latches at the top and bottom of the door and are activated by rods that are mounted on the surface of the door. The Von Duprin 22 is the name of the rim device, the number for the surface vertical rod is known as the 2227. This post is about the 22 Rim Device, I am sure we will have one on the 2227 shortly. In these two types, we have two other designations, one is Panic Hardware, and the other is Fire Exit Hardware. Panic Hardware is usually an 1-1/2 hour rated device. Meaning if there is a fire, it will contain it for an 1-1/2. Panic Hardware usually has the ability to be dogged open. The dogging is done by turning the 5/32″ hex key. Fire Rated Hardware is always used on interior doors and is designed to contain a fire from spreading through the whole building. A Fire Rated device will not have the ability to be dogged open, these doors are always supposed to positively latch. We see the Fire Rated devices on stairwell doors, but in larger buildings we see them everywhere on interior doors. The Von Duprin 22 comes in two different lengths. One is 36″ and the other is 48″. 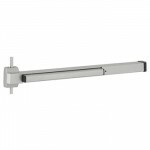 The 22 can be cut down to work on doors as narrow as 26-1/2″ wide. If you have a 36″ wide door you would order the 36″ device, but if you have a 42″ wide door you would order the 48″ and cut it down in the field with a hack or chop saw. Out there in industry we see three levels or grades of panic hardware. The Von Duprin 22 is rated Grade 1, which is the highest rating possible, generally equal to 10,000,000 cycles without a failure. There are many devices out there, make sure you get a Grade 1, in the long term it will be worth it. The Von Duprin 22 is constructed of formed cold rolled steel. It is then powder coated to dark brown or aluminum colors. There is some plastic on this device, and that is the end cap, however Von Duprin know has an optional Metal End Cap. The Von Duprin 22 is designed for all types of single and double doors with mullion, for door stiles as narrow as 3-13/16”. The door stile is amount of room you have on around the edge of the door. If you have an aluminum framed glass door, chances are the stile is only 1-3/4″, the Von Duprin 22 will not work on this door. 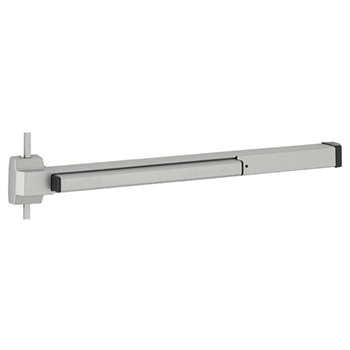 In the last 20 years we have seen a lot of growth in the imported exit devices, with names like Global Door Controls, International Door Closer and many more. You can purchase there devices for a little less, but what happens when something breaks on them? Generally you have to purchase a completely new device from them. Not with the Von Duprin 22, as with all there products, detailed parts breakdowns are available, and there replacement parts are stocked by them. We keep just about every replacement Von Duprin 22 part in stock, getting the part is as simply has picking up the phone or visiting our website. The differences between the Von Duprin 99 and 22 are many, but here is the short list. The 99 has a plated finish, not painted like the 22. The 99 has quieter operation due to an internal shock absorb er, the 22 might not be the best device for doors on a theater or library. The 22 has a smaller foot print then the 99, the active head on the 22 is about half the size for the 99. 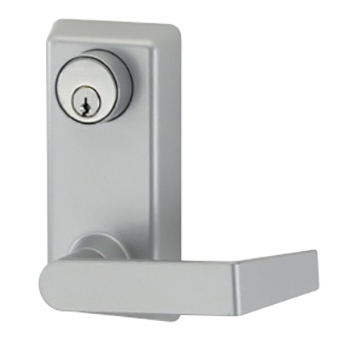 The Von Duprin 22 offers 9 different styles of exterior trims or handles. 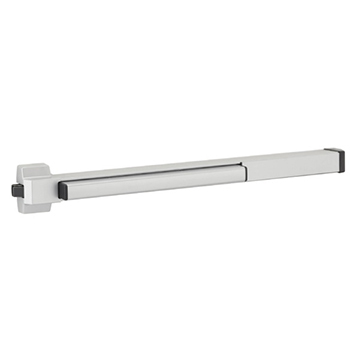 The benefit of using there handles is that they have stanchions welded on the back of the plates, and make the interior device and outside handle one unit. They offer a standard line of trims. You can order the Exit Only, Dummy, Night Latch, Thumb-piece, Knob and Lever. The also have an optional line which is a more Traditional looking Dummy, Night Latch, Blank Escutcheon Lever and Knob. This is also beneficial because it insures that the key cylinders line up with the panic device. As with the device a full list of replacement parts are available and usually in stock. Along with the optional outside handles the Von Duprin 22 also offers a few electrical options. They have a Request to Exit Switch, Latch Bolt Monitoring Switch, and an Alarm Kit. The complete Von Duprin 22 devices will ship with the standard strike and all of the mounting screws. If you do order one of the optional trims that have a key cylinder, the key cylinders are not included. 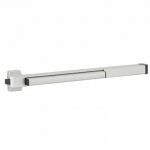 Another benefit of the 22 is they are non handed, meaning they will work on a left or right hand swing door. If you have any questions, or would like more information on the Von Duprin 22, please drop us comment. We have all the part break downs, and templates for all of the 22’s and any Von Duprin that is out there.